Flea infestations are treated with an insecticidal spray which is a modern biodegradable insecticide that is odourless, non-tainting, non-staining and non-corrosive. It is vitally important that animals and pets are pre-treated prior to treatment to ensure full benefit from the insecticide. This pre-treatment will have to be carried out by the owner or a qualified vet, please not that we are not allowed by law to carry out treatments on animals. The treatment by necessity, will encompass the whole of the house/office/premises to ensure that enough product is applied to eliminate the problem. 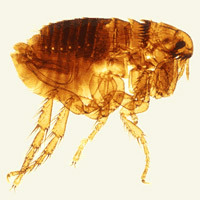 Before commencement of treatment, the owner must vacuum thoroughly the infected area to elminate the majority of adult fleas ensuring that the bag is properly disposed off afterwards. Floors must be clear of all onjects (shoes, newspapers, toys etc) along with any objects under beds. Following treatment do not vacuum or indeed clean or mop treated areas for at least two weeks.